One aspect of public speaking that doesn’t get enough attention is the question and answer (Q & A) session. Often, the speaker is very focused on perfecting and practicing their speech, and the Q & A gets the shaft. It might not seem worthwhile to put too much thought into this, but how you handle the questions thrown at you can help solidify or weaken your credibility as a speaker. A. ALLOT a specific amount of time to answer questions. Timing is a factor often overlooked when deciding to conduct a Q & A session. 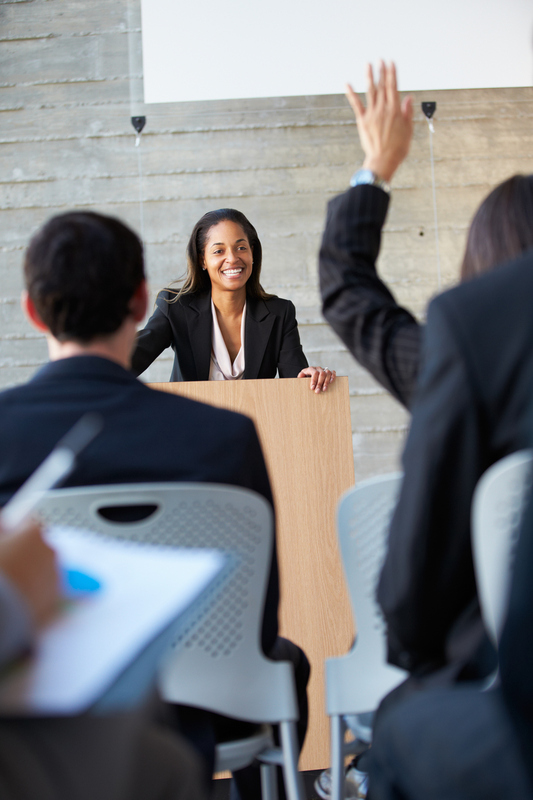 Just like every speech and presentation has a set start and end time, the same should go for the question portion. You want to maintain control of your presentation as a whole, and that includes considering in advance how long you will take questions. Alternatively, another route you can go is deciding how many questions you will take before you wrap it up. Either approach works, but let the audience know what to expect so it won’t seem like you’re cutting off their questions abruptly. B. BE prepared. You can get asked ANYTHING, so it’s good to anticipate what questions you may get asked. A great way to become a pseudo-mind reader is to give your speech in front of family or friends, and find out what questions they have. This is a very insightful exercise because you may think you covered all the bases in your speech, but you may discover there’s a point or idea that’s not clear or one you hadn’t even thought about that is worth mentioning. Keep a list of these valuable gems gleaned from these practice sessions, so you can be prepared to address them should they come up during your Q & A. You won’t be able to predict every question, but a little preparation can go a long way. C. Don’t CLOSE with Q & A. This probably seems counter-intuitive, but Q & A should not be saved for the very end of your presentation. When it comes to presentations, the law of primacy and recency says that people are more likely to remember the first and last things they hear. You should always aim to finish your speech strong with your own final thought. Plus, if you get a oddball question from an audience member, you don’t want that to be the last thing that lingers with the group before you leave the stage. Your Q & A session should be held right before you end with your own impactful conclusion. D. Answer DIRECTLY. It’s important to answer the question that is asked. Sometimes speakers answer the question that they think was asked. They probably just misunderstood the question, although it’s also possible that the speaker didn’t know how to answer the question and didn’t want to admit it. Either way, you don’t want the audience member to think you’re avoiding their question. If it’s the latter, it’s perfectly fine to say that you don’t know the answer but that you will look into it and get back to them. Get their name and contact information so that you can indeed follow up. Otherwise, just clearly and concisely state your thought or belief to what was asked. The Q & A session is a great opportunity to showcase your expertise and add value to your message. Give it the attention it deserves with a little forethought.